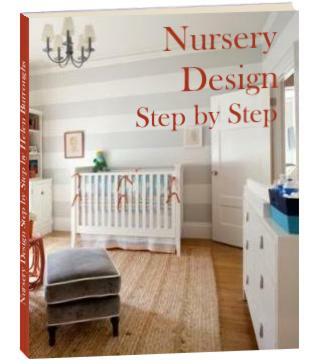 The use of various paint techniques to decorate your nursery wall is one of the easiest and most cost-effective ways to jazz up your nursery design. First decide on the size of circle that you want. Remember your circles do not all have to be the same size. Then decide whether you want your circles to be filled in (polka dots) or just outlines (circles). You can also use a combination of the two. Next decide on a pattern. For the smaller circles, look for items around your home that you can draw around. You can use anything from a baked bean can to a large dinner plate. If you want bigger circles you will need to use a simple circle making tool. Attach a pencil to one end of a string. Attach a push pin to the other end. Stick your pin in the nurseyr wall where you want the middle of your circle to be. Pull the string taut and move your pencil around the push pin forming a circle. The longer the string, the bigger your circle will be. Adjust the length to form circles of different sizes. Draw your circles where you want them placed on the baby nursery wall. They don't all have to be separate - overlapping produces an interesting effect too. If you want polka dots, fill the circles in with your chosen nursery paint color. If you want to outline them too, let the inside dry first then follow the outline around with a different nursery color. If you want circles you will just paint in the outline. Cut your circles out of poster board and attach them to your baby nursery wall using double-sided sticky tape. Move them around until you find a pattern that you like, then draw around them with a pencil. Remove the circles and paint with your nursery colors! See how one mom shows us how to paint a wall with polka dots in her whimsical nursery. Don't forget to check out our polka dots and circles baby nursery bedding sets!